Nothing beats getting together for some seriously satisfying classic beef Tacos. The unique flat bottom means these soft tacos stand up on your plate – they’re so easy to fill everyone can do it! 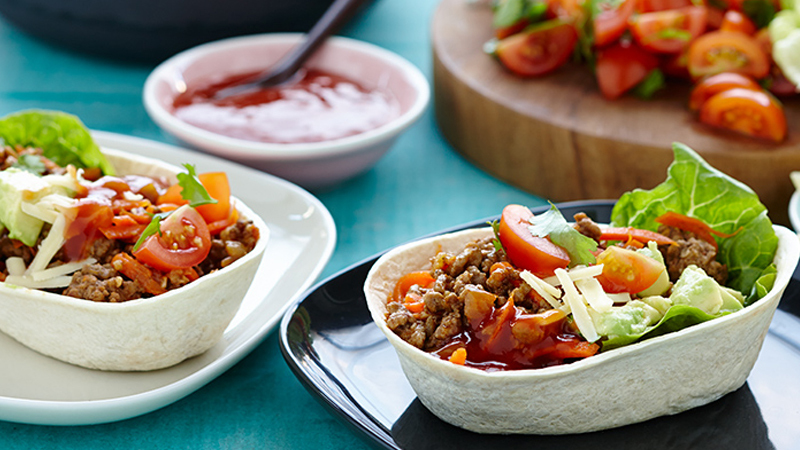 Just add classic seasoned mince beef and fresh ingredients like avocado, coriander and tomato and you’re sure to put a Mexican meal on the table everyone will love! This simple recipe creates delicious Mexican flavour right in your kitchen. Heat a little oil in a non-stick frying pan. Add onion and cook until soft. Add beef mince, stirring with a wooden spoon, cook for 5 minutes. Add carrot, Taco Spice Mix and ½ cup of water. Simmer for 2 minutes or until sauce thickens. Combine tomato and coriander to make a fresh tomato salsa. For warm Tortillas: Remove tortillas from pack and divide into 2 stacks. Microwave: on HIGH/1100 watts/100% power for 20 seconds* Oven: wrap in foil & heat in a pre-heated oven at 180˚C (160˚C fan forced) for 7 minutes. DO NOT HEAT TORTILLAS IN THE PLASTIC PACKAGE *Times may vary depending on microwave wattage. Decrease time for fewer Tortillas. Increase time when using a microwave oven lower than 1100 watts. Oven: wrap in foil & heat in a pre-heated oven at 180˚C (160˚C fan forced) for 7 minutes. DO NOT HEAT TORTILLAS IN THE PLASTIC PACKAGE *Times may vary depending on microwave wattage. 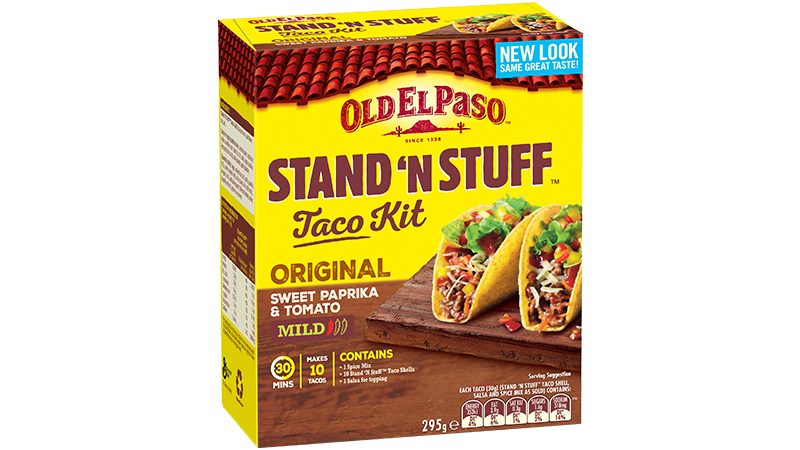 Build your own Soft Tacos with Stand ‘n Stuff™ Tortillas, seasoned beef, fresh tomato salsa, avocado, cheese and lettuce.